‘In 2014 I went to the GP after suddenly getting panic attacks, which wasn’t very ‘me’. 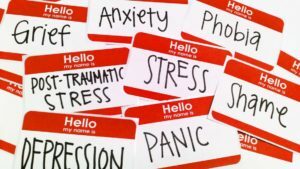 I began to show symptoms of anxiety, but I assumed this was down to me putting a lot of pressure on myself as after the summer I was going into my GCSE year at school. In that summer, I witnessed a suicide, something that haunted me, but that I never spoke about. I began to hallucinate, thinking the man I witnessed ending his life was with me. I suppressed these thoughts for over a year and never really spoke about the event. Having managed to be made head girl at school things were looking exciting for my future. But in 2015, my situation took a turn for the worse. I wasn’t sleeping, my confidence had dropped, I was feeling so alone. I began to hear a voice in my head, a nasty voice, a voice that was tormenting me. This ‘voice’ made it very clear to me that I was not to speak to anyone about this. I abided. I completely lost touch with reality, I stopped going to school, the world was different, I was different. I couldn’t make sense of things. People at school started rumours, but very few people reached out. I guess they were just as confused as I was. On the 26thMarch 2015, I had my first psychiatrist appointment. I remember the psychiatrist telling my mum: ‘J described having psycho moments’ and ‘J appeared highly anxious’. I’d never felt so disconnected from the world. My sister began to stay at her boyfriend’s house almost every night of the week, and my parents didn’t understand what was going on. I was urgently referred to an Early Intervention Psychosis Team. Every medical professional I saw asked me if I’d ever taken drugs before. My answer was always a truthful ‘No.’ I was prescribed anti-psychotic medication which didn’t change anything for me. The voices were still very much there, and so was the threat not to tell anyone. By the time my 16thbirthday came around, I managed to celebrate for about 20 minutes before I couldn’t handle the amount of people in my house. It was only my close family, but it was just too much. On the 24thApril I was urgently referred to a hospital in Oxford. I had a psychotic episode that was so bad that my GP had to bring pills to my house so I would go to sleep. I remember waking up in the car on the way to the hospital – with a bag that had been packed for me. I was in that hospital for 5 months. Whilst I was there, I was diagnosed with as having bi-polar disorder. This was the first time I’d seen my parents break down crying. I was told I had to go to therapy to accept this diagnosis; one I was going to carry with me for the rest of my life. The summer came and my peers began their GCSE exams, whilst I was in and out of hospital. I did do my GCSE’s, but from the hospital I was in at the time. By now, I had little to no contact with my friends and peers apart from one or two people. When the time for my school prom came, I felt I had to go – this was something I’d looked forward to for a long time and it would be a nice way to end my school years. When I arrived, I was petrified but excited. Unfortunately, prom was the opposite of how I expected it to be. Barely anyone spoke to me, but I could sense the whispers; I could sense the curiosity. I just wished people had asked me questions. I would’ve been very happy to answer them. 2016 and 2017 were probably my lowest years. I was in and out of hospital constantly, I couldn’t get out of bed and when I did it was to self-harm. My parents began to hide sharp objects from me, the medicine cabinet was locked, and I felt I was placing a heavy strain on my family. I was consumed with suicidal thoughts and fantasies and after many failed attempts my parents were monitoring me 24.7. June 2018 was a turning point. I was admitted to yet another hospital; this time in Southampton. This was when everything changed for me. It was the best place I’d been to. It was full of young people who had hope in their eyes. Slowly but surely, I began being honest with myself – about what I’d seen, what I’d been through and what my life was turning into. The real turning point was when a male psychiatrist said to me ‘You will get better J, within the next 5 years you won’t be feeling this way and you will be okay.’ And just like that, I had hope in my life. Hearing the words ‘You will get better,’ suddenly shifted everything. I began to take control of my life, I didn’t see my parents for a month – as I felt I had to be the one in charge of my decisions. I felt excited for the future, an emotion I forgot I could feel. I started losing weight, I was looking more like the old me. I came off all my anti-psychotic medication as it just made everything seem blurry. I was starting to get my spark back! I was discharged in September 2018. My real recovery started from this point onwards. I haven’t heard a voice in months, I feel like me again. I have a new-found confidence and enthusiasm. In terms of my education, I go to college once a week, and I volunteer for a charity twice a week. I have plans to go to university in September 2019 to study English, something I have always wanted to do but never thought I could achieve. For me, things changed when I was honest. When I was honest with myself, honest with the people around me and honest about the traumatic event I had witnessed, things started changing for the better. My diagnosis is now complex PTSD (Post-Traumatic Stress Disorder.) I know that this is just the beginning for me, I have a lot to catch up on. But I take it day by day. Slowly but surely – I’m learning that it’s okay to not be okay, that some days are better than others, but most importantly that I am not just a diagnosis. *This interview is a true story however names and places have been changed to protect this persons identity.